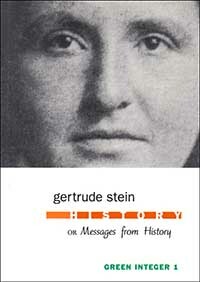 Written in 1930, History or Messages from History explores the meaning of history in opposition to what Stein scholar Donald Gallup has described as its narrative of past, present, and future events and rumors. In this poetically conceived prose work, Stein sets historical concepts against narrative patterns of meaning. Words and phrases such as baking a cake, birds, apricots, begonias, dogs, horses and oxen, and many others are subtly repeated, each time in a slightly different context, to weave a seeming narrative pattern which is set against the readers own history as he or she makes their way through Steins text. History is the learning of spectacular consistency privately and learning it alone and when more comes they receive. Written at a time when Stein was exploring concepts of history through her historical dramas and other writings, History or Messages from History is a crucial work in understanding her ideas.